The Blog of Thog: I accept the embarrassment. Something that I did in my past keeps coming back to remind me of how...odd... I can be. So to deal with the various people thinking that they can embarrass me by referring to it, I decided to blog about it. Now at the opening ceremony, they were dishing out free stuff, t-shirts, lanyards, the usual stuff. 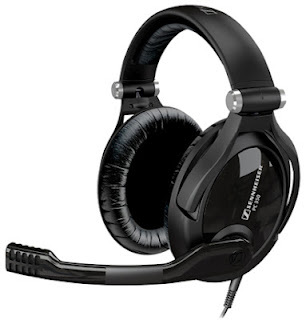 These is a Sennheiser PC 350 headset. A very nice piece of kit, great for gaming, an all round excellent headset. And not a cheap one. Even today you'll do well to pick up a pair for less than £100. Anyway, they threw one set into the crowd, and kept the second back to do something with at the end. I thought to myself They're going to make someone do something embarrassing on stage, then give them the headset. So, I made sure I got my hand up first. For those unaware, I was attempting to replicate the female night-elf dance from World of Warcraft. I'm aware that I missed a chunk of it out (you can see it here) and obviously wasn't that good, but at least the crowd (and many people who have seen it on YouTube since - I never thought about it being recorded!) got a good laugh. Surprisingly to me, I got a lot of positive feedback afterwards, from people impressed that I was willing to do it. The other thing I get is people asking for a repeat - I always say that if they're willing to give me another £100+ headset for a minutes work I'll consider it! Am I pleased that I did it? Ultimately, I guess so. We're on this planet for such a short time (where we go from here we all have our own views on) that shouldn't we really make the most of it? I'd rather be considered weird than boring. 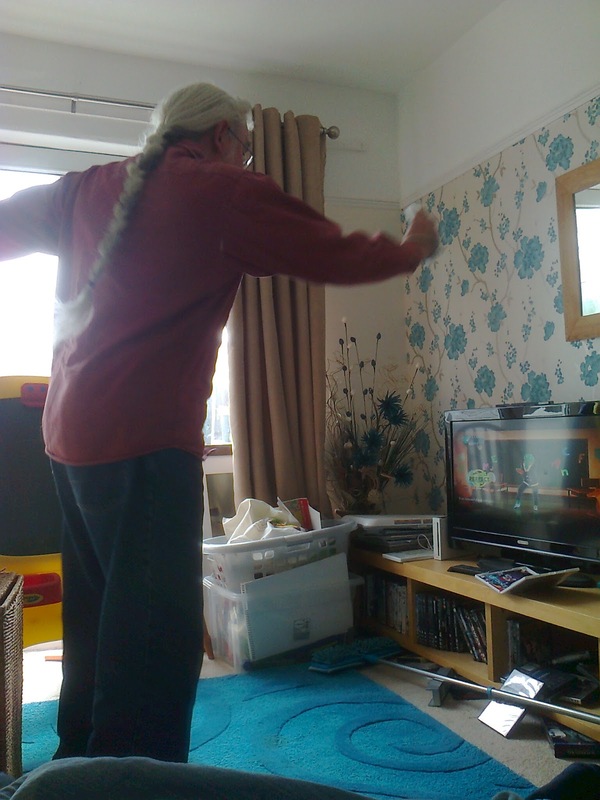 Here's a photo of my dad playing Just Dance 3 on the Nintendo Wii. With his first attempt ever using a Wii, and using the controller with his other hand (he's left handed) he still did better than me. 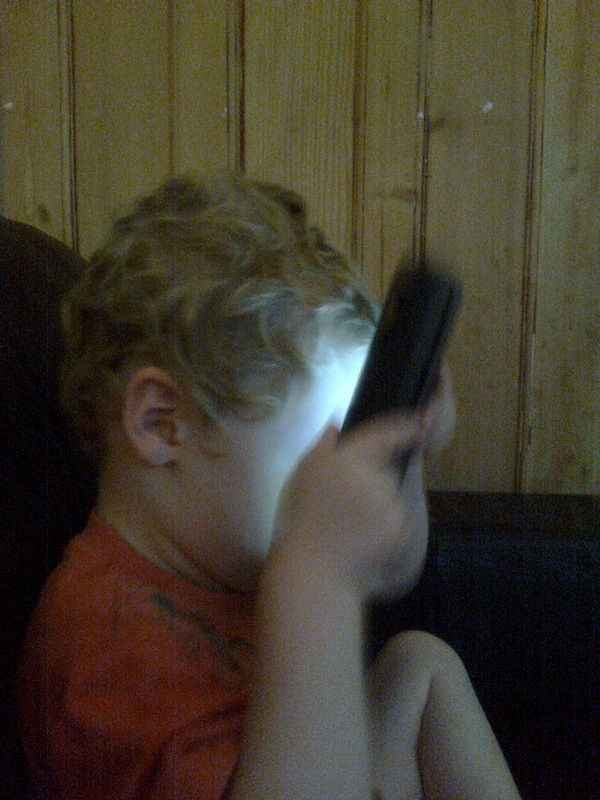 And here's my son controlling the touchscreen on my tablet with his nose.